The Railway Department had lodged a complaint with the Criminal Investigations Department (CID) yesterday, alleging that railway workers on strike had caused damages to train engines and compartments, Additional General Manager (Operations) Vijaya Samarasinghe said. The Railway Technical Services Trade Union Committee (RTSTUC) refuted allegations that they had sabotaged the railway operations. “We are the ones who identify technical faults and address them. Now without us, when they cannot identify the technical issues, they are blaming us that we have sabotaged the train services. We work with these trains and we will never do anything to damage these machines that we earn a living by. Afterall, once the strike is over we have to go back and work, so why should we damage these engines?” RTSTUC Secretary Kamal Pieris said. The railway technical service workers had launched a 48-hour token strike from 4.00 pm on Tuesday demanding for a pay hike and several other demands. Chairman of the Committee P. Sampath Rajitha said, “The wages of five grades had been increased by 12% and this has caused a salary anomaly in the entire railway cadre.This discrepancy should be resolved and all railways workers should be given this 12% pay hike. This is our main demand and we have still not received a favourable response to our demands,” he said. He warned administrators not to lay their hands on the said salary increments as promised, which could lead to a further extension of the strike. Railways Additional General Manager, Vijaya Samarasinghe had issued a circular calling on all casual, assigned and contract workers of the Railway technical service to report for duty immediately. 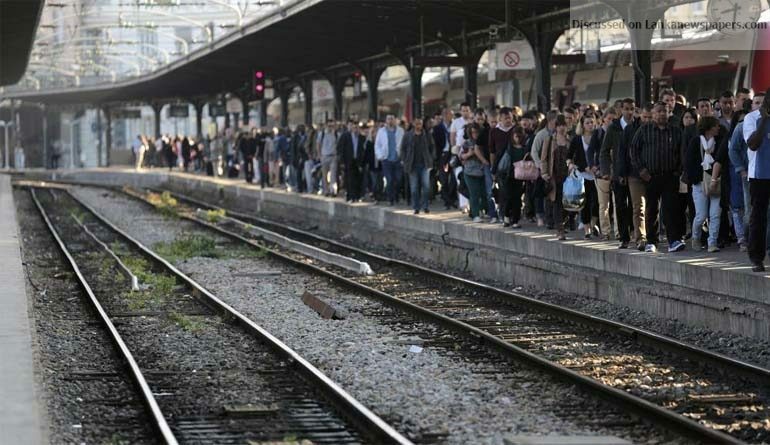 In the wake of the strike action, the Ministry of Transport and Civil Aviation had taken a decision to cancel the leave of all railway workers. However, although the Railway technical services committee claimed that the strike action was successful, according to several other unions, the strike action had been a flop and the train services had operated without any glitch. They said that all 27 train services on the main line from various parts of the country to the Colombo Fort railway station had operated on schedule yesterday except for slight delays. The Railway Operations Supervisory Union (ROSU) Convener Lal Ariyaratne said the striking group is trying to sabotage the salary hike they received with the greatest difficulty. “They had cut the electric cables of all the night mail trains and they are trying to deny us the increments we obtained after a great struggle,” he said. Meanwhile, Transport and Civil Aviation Minister Ashoka Abeysinghe at media briefing in Colombo said, it is unfair for the railway workers to strike, since they were granted a discussion with the authorities on Friday. He said striking workers have damaged four train engines and one power set.The minister said the 48-hour token strike launched by the railway technical service staff since last Tuesday is totally unsuccessful. In addition to the CID and Police investigations,a separate investigation will be conducted internally. He said that strikers had removed a large number of cables of trains. Cables of four engines (M 10-915, M 4-744, M 4-749 and M 9-866 ) parked at E.L.S railway yard and H.L.S railway yard have been removed while the motor fan and the cables of the no 79 train engine have been entirely removed. The trains (TC 15013, SC 15603, SC 15638, TV16044, POV 15651, SCS 15996, SC 15594, SC 8328 and SC 8310) have been subjected to sabotage. The cable system of no 5067 train has been completely removed while the PVC parts of the cable system of no 15899 train had been broken. As the strikers have damaged a signal cables at the Lunuwila railway station, there was a delay in getting trains in and out.He said the damage of three train engines had been noticed when they were being moved out of the Dematagoda yard. Abeysinghe said the strikers’ preliminary demand is increasing their salaries.“We promised them to resolve the problem after the Railway service was made as closed department,” he said adding that the Ministerial Committee appointed to solve the problems of railway workers have recommended the salary anomaly would be resolved through this proposal in the future to prevent further strike action. The proposal has already been granted Cabinet approval and this will at least take another six months to resolve all issues. The 48-hour token strike launched by the railway technical service staff was over by 4pm yesterday. According to the Trains Control room, no train service has been suspended although several train delays were reported due to the strike.